vmWARE had originally planned to retire the VMware Certified Advanced Professional (VCAP) certification altogether. However, based upon customer feedback we are reversing that decision (refer to the diagram below). For v6 the VCAP level will not be going away. You will be able to earn a VCAP6 Design and/or a VCAP6 Deployment certification when you pass the corresponding Design exam or Deployment exam (lab). Furthermore, in addition to the individual VCAP6 certifications, VMware gives special recognition to those that earn both Design and Deployment certifications as this is a significant achievement. 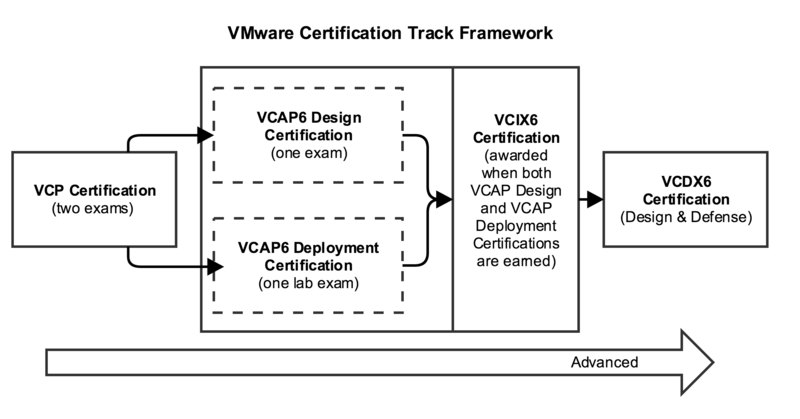 So, beginning with v6 those who earn both VCAP6 Design and VCAP6 Deployment certifications will be awarded the VMware Certified Implementation Expert 6 (VCIX6) certification for that track. There are no additional requirements – earn both VCAP6 Design and VCAP6 Deployment certifications and you will automatically receive VCIX6 certification. Because both Design and Deployment skills are critical, our goal is to get as many people as possible to upgrade to the VCIX level. For that reason, VMware’s Design and Deploy training courses will cover both skills, the VCIX6 certification will be the prerequisite to becoming a VMware Certified Design Expert (VCDX), and special benefits will be awarded to those who achieve VCIX6 certification. From VCAP5 Design to VCIX6 → Earn the VCAP6 Deployment certification by passing the VCAP6 Deployment Exam (lab). From VCAP5 Administration to VCIX6 → Earn the VCAP6 Design certification by passing the VCAP6 Design Exam. One last note: The VCIX6-NV certification will continue to be a little different for the foreseeable future (there is not a Design Exam component). There will only be a VCIX6 Deployment exam and a VCIX-NV certification can be earned by passing the related Exam. In our current framework the Design component for Network Virtualization is covered at the VCDX level. This will likely change in 2016.